The 41st HighSchoolOT.com Holiday Invitational Tournament is underway in Raleigh. The boys (20 teams) are playing at Broughton HS in Raleigh and the girls (8 squads) are encamped at Cary Academy through Saturday. After four decades this has become one of the top prep tourneys in the country, and local ACC fans turn out to watch Duke, Carolina and NCSU recruits on the hardwood. The atmosphere is electric for the evening games in a jam-packed Holiday Gymnasium at Broughton. Friday night in the Broughton HS gym. Photo by Bryan Hanks, tournament media coordinator. Back in October MaxPreps/CBS Sports named the HighSchoolOT.com Holiday Invitational a MUST SEE prep tournament. 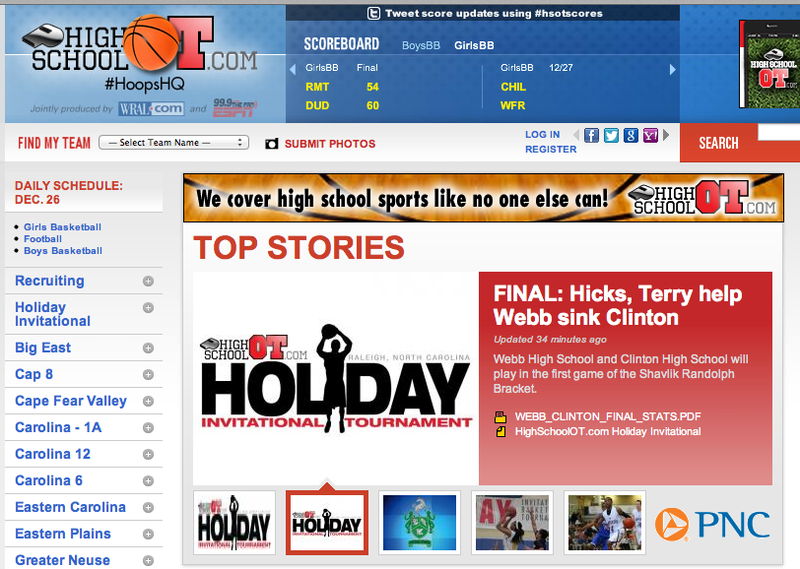 Everything you could possibly want to know, from brackets to blogging, from game stories to video clips, can be found at our HighSchoolOT.com website.